Say it with words. 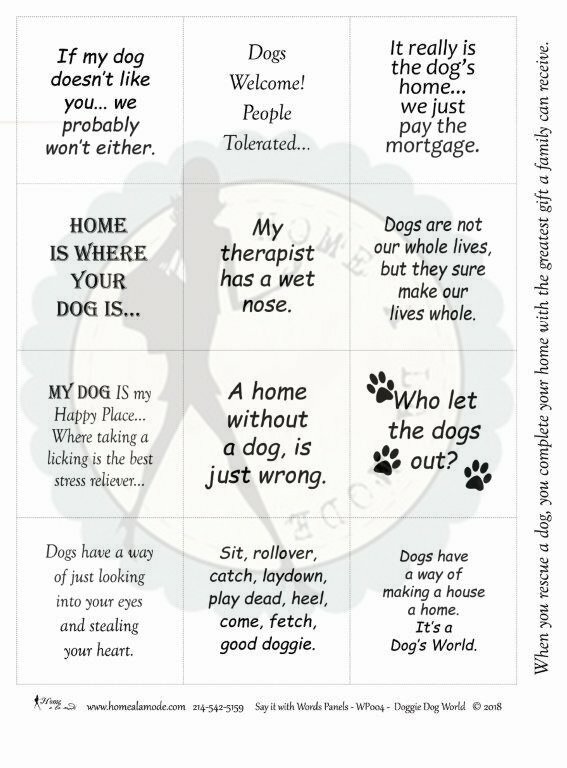 Doggie Dog World is a Home a la mode word panel that is all about the serious side of our feelings and the fun learned rules for our dogs... like: If my dog doesn't like you... we probably won't either. - Dogs Welcome! People Tolerated... - It really is the dog's home... we just pay the mortgage. - Home is where your dog is... - My therapist has a wet nose. - Dogs are not our whole lives, but they sure make our lives whole. - My dog IS my Happy Place... Where taking a licking is the best stress reliever... - A home without a dog, is just wrong. - Who let the dogs out? - Dogs have a way of just looking into your eyes and stealing your heart. - Sit, rollover, catch, lay down, play dead, heel, come, fetch, good doggie. - Dogs have a way of making a house a home. It's a Dog's World. - When you rescue a dog, you complete your home with the greatest gift a family can receive.